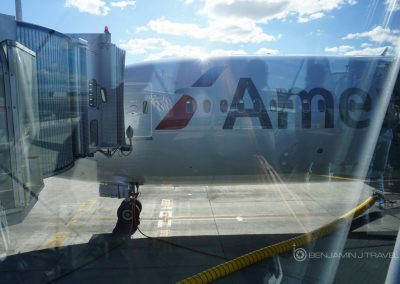 After experiencing American Airlines’ Premium Economy on the 787-9 just 2 days prior, it was time to make the same trip home. 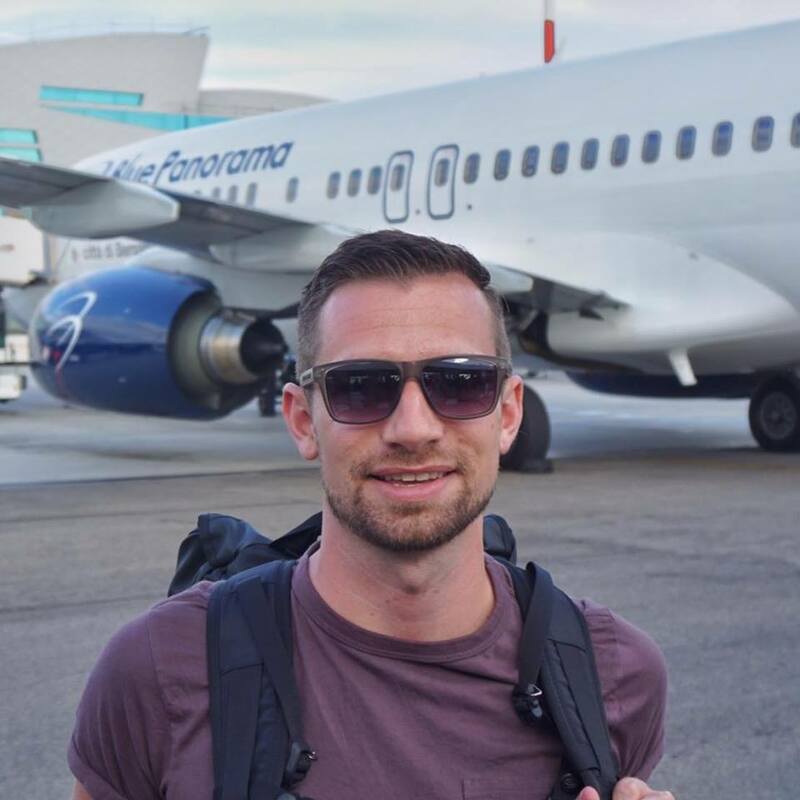 Same aircraft, same cabin and even the same crew! 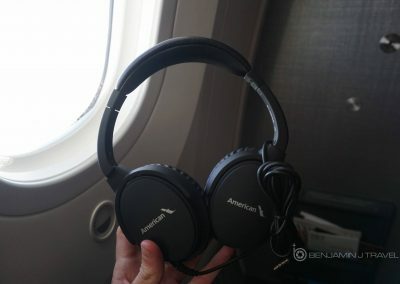 As a travel blogger, it was an interesting experience to compare identical travel products just 2 days apart. I had a pretty good experience on the outbound so I was hoping for an experience as good or better. The AA Premium Economy product has been introduced on their new 787-9s. 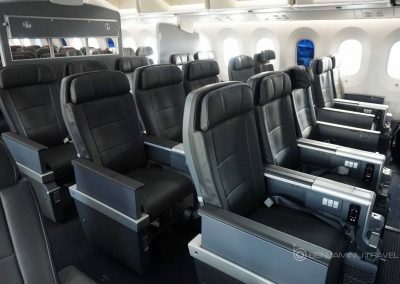 American is currently offering Premium Economy seats complimentary to elite members (Executive Platinum and Platinum at booking) and are being sold as standard Economy tickets. 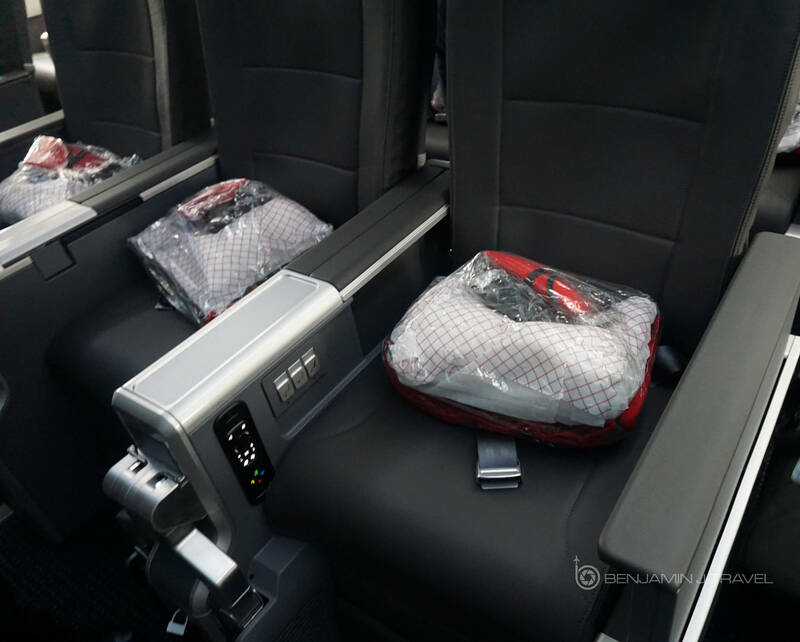 Until April 2, 2017, these seats will appear just like Main Cabin Extra on the seat map. 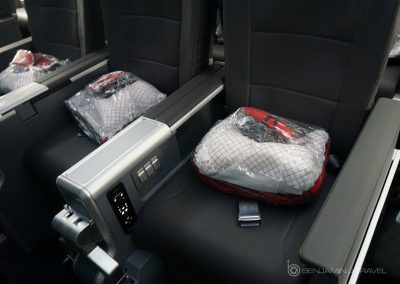 Come April 2, 2017, these seats will be sold as their own fare class. While the long haul soft product with enhanced amenities and meal service launched on November 4, 2016, the “official” launch date for AA Premium Economy is April 2, 2017. The inbound aircraft from DFW has been delayed and I had been notified by American the night before. It was scheduled to depart about 90 minutes late. Ultimately, the aircraft had left DFW for Madrid over three hours late. This gave me a bit more time in Madrid that morning but I still arrived at the airport on the early side. 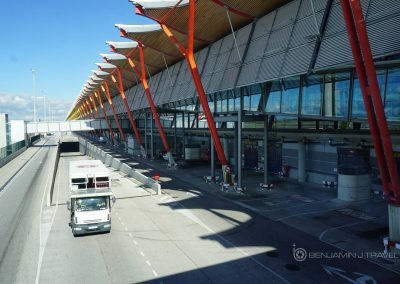 Madrid is a beautiful airport (one of my favorites to photograph) but it’s also one that requires long walks. 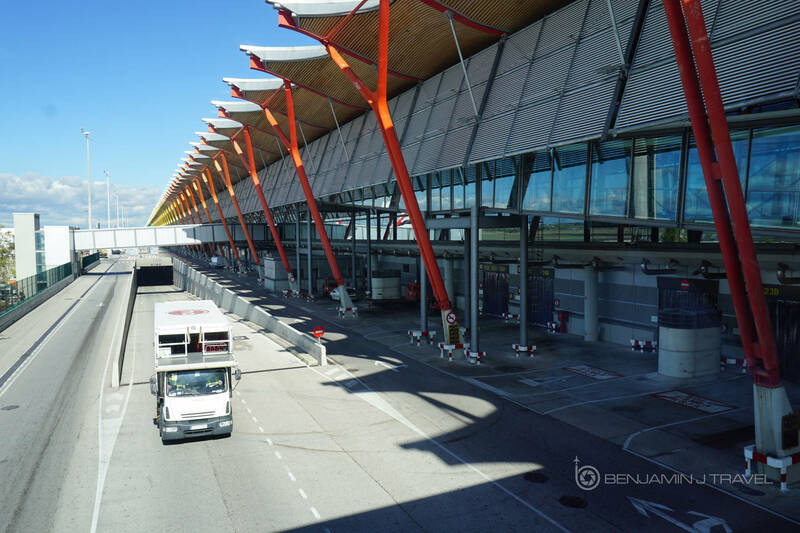 Plus since we were departing from Terminal 4S, a long tram ride is required from the main terminal. 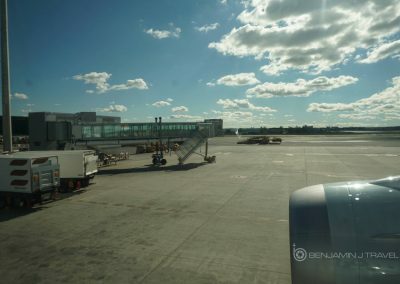 I spent a couple of hours at the Iberia Lounge and waited for the boarding announcement for AA flight 36. I asked the lounge staff if they knew when boarding would begin since the flight was delayed. They said the exact boarding time was unclear but an announcement would be made. Boarding ended up being announced about an hour later than scheduled and I made my way down to gate R7. Unfortunately, the lounge staff announced our boarding a bit late as I ended up being one of the last to board. 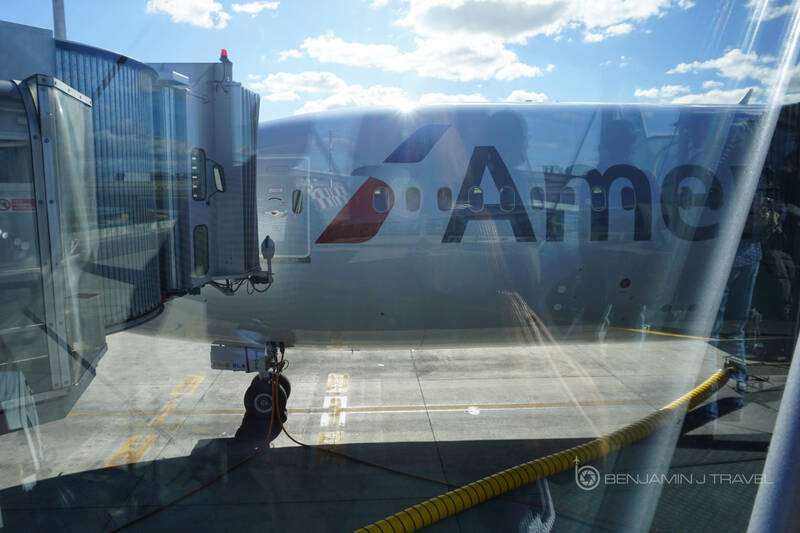 We boarded through door 2L and I headed to the opposite side of the Premium Economy cabin and took my seat in 9L, the bulkhead window. I was greeted by the same crew I had on the outbound flight from DFW. There were 3 folks that were attempting to swaps seats so I ended up sitting next to a new seat mate. 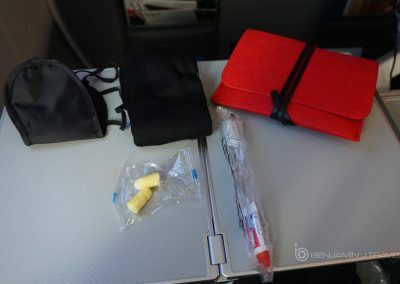 On my seat was the AA Premium Economy amenity “bundle” with a premium blanket, standard pillow, small red amenity kit, and “noise-reducing” headphones. We were already delayed in boarding but we spent a good amount of time at the gate before pushing back. 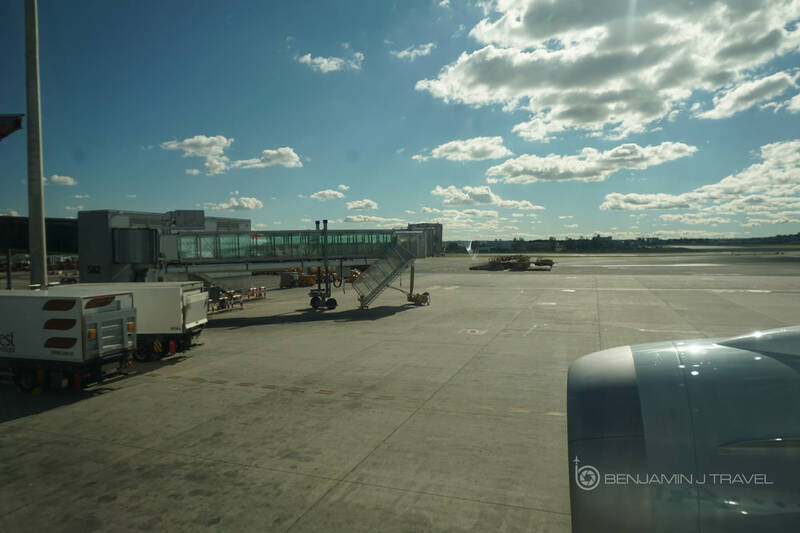 We ultimately departed about an hour and 45 minutes late from our scheduled departure time. 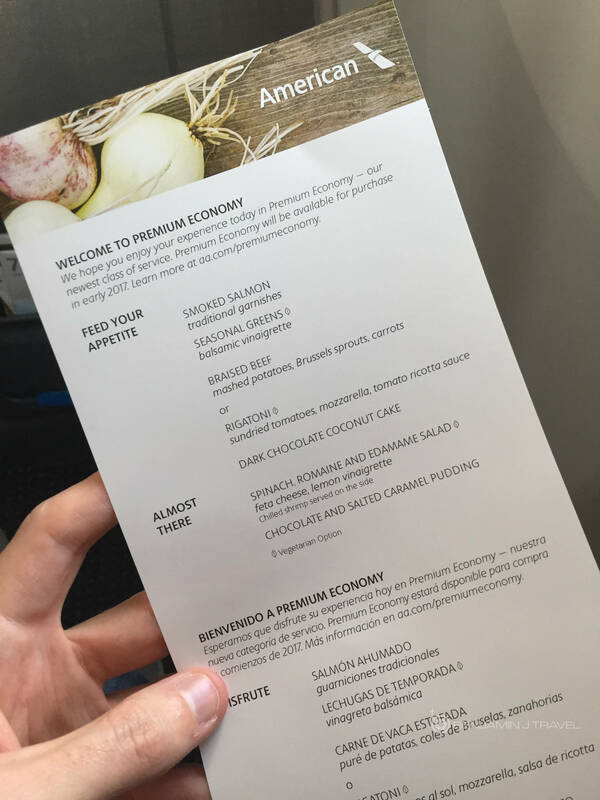 Just before push back, the crew passed out printed menus from the Premium Economy cabin. 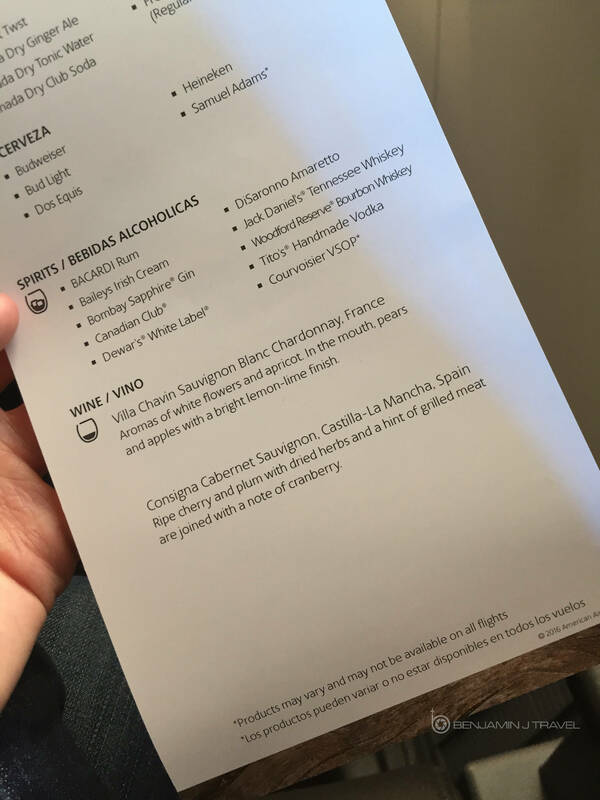 This was in contrast to not receiving menus on the outbound flight from DFW to Madrid. 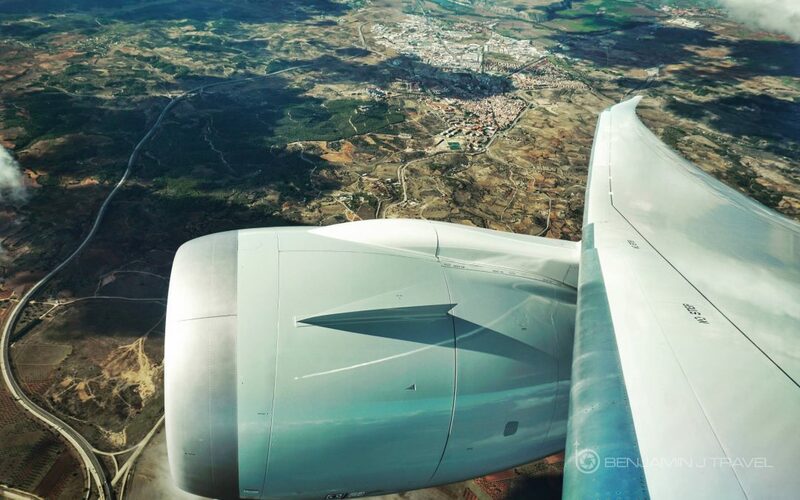 We had a scenic, smooth climb out of Madrid and we were quickly at our cruising altitude. I connected to the in-flight WiFi as soon as it was available as I had quite a bit of work to catch up on. As I’ve mentioned before, I do think AA’s international WiFi is reasonably priced at $19 for the whole flight. For at least 10 hours of use, it’s a good value for me. About 30 minutes after departure, we were handed out snack mix and offered drinks. I opted for the Spanish Cabernet Sauvignon which was actually quite a good wine. 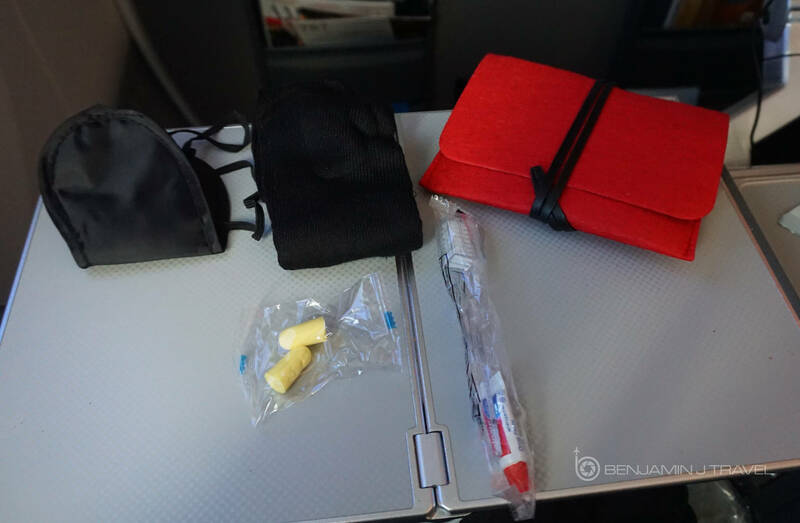 The snack service is identical to what is offered in standard Economy. Lunch service began about an hour after departure. We were offered a choice of the Braised Beef or Rigatoni pasta (this was the vegetarian option) and I opted for the Rigatoni. The tray was pulled together on the cart and served on a single tray. 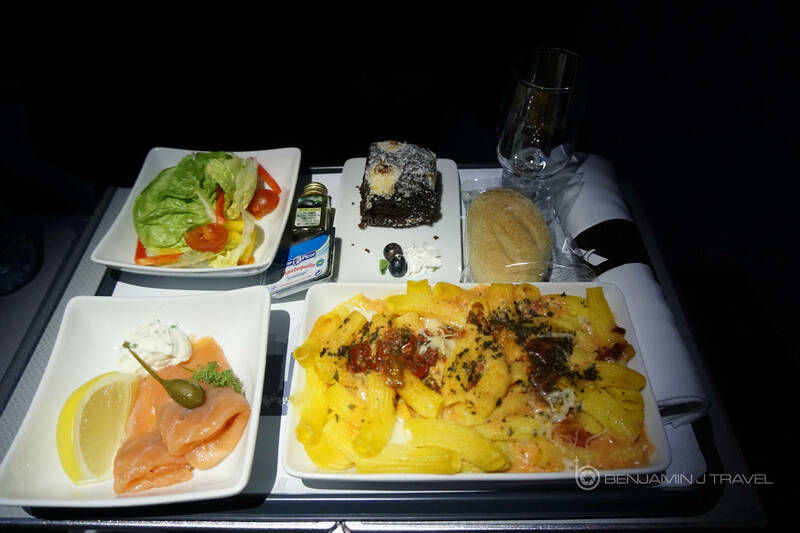 Food is served on ceramic dishes, similar to Business Class. Glassware was provided for wine and spirits, This time, unlike the outbound, the crew poured wine into our glasses and collected out plastic cups. Meal service on this flight was a bit better than the outbound flight from DFW to Madrid. The crew was a bit more comfortable with the new Premium Economy cabin. I have to admit I was thoroughly impressed with the catering on this flight. 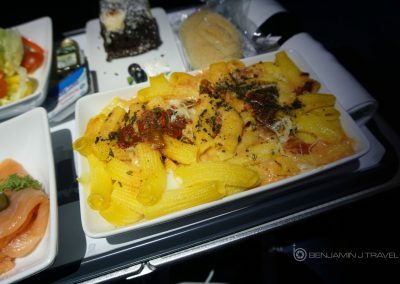 Perhaps it helps that the meal was catered out of Madrid but the food was incredibly good for an in-flight meal. The smoked salmon was excellent and the Rigatoni had a robust flavor. 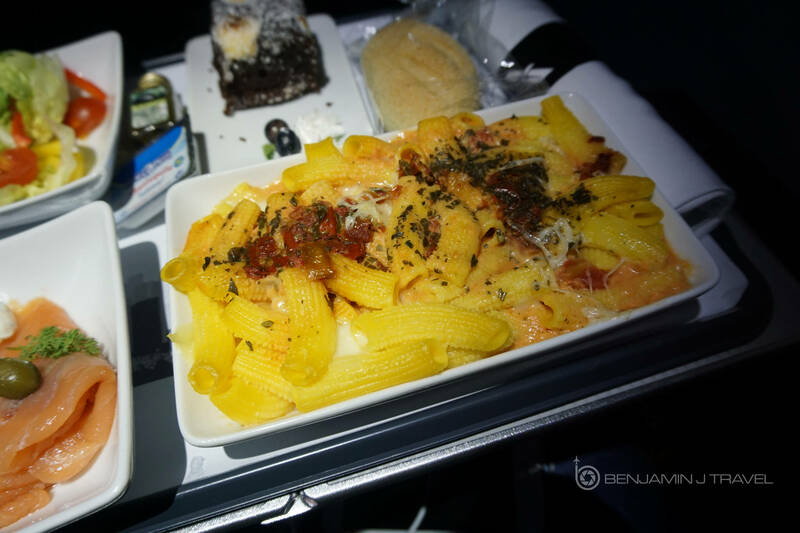 In recent memory, this was one of the best in-flight meals I’ve had. American nailed this one! Trays were collected about 30 minutes later and the cabin began to quiet down. 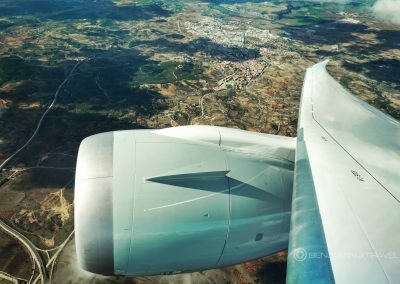 Thanks to the electronically shaded windows on the Dreamliner, the crew can easily keep the cabin very dark during day time flights. I continued to catch up on some work for about two hours before pulling out my blanket, reclining my seat, and catching a bit of a nap. 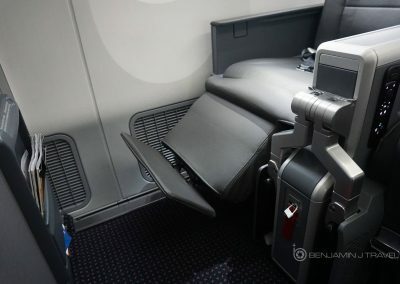 Keep in mind the bulkhead row (Row 9) has leg rests while Rows 10 and 11 have foot rests. 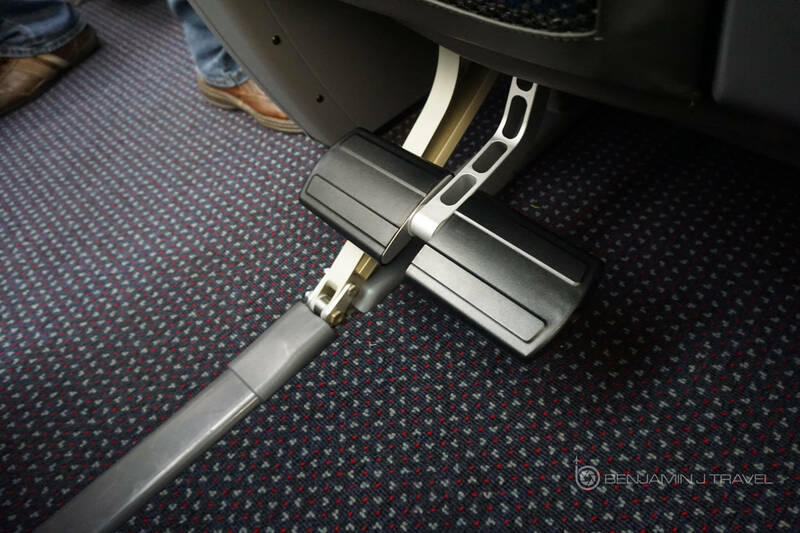 Both are adjustable and comfortable in their own right. 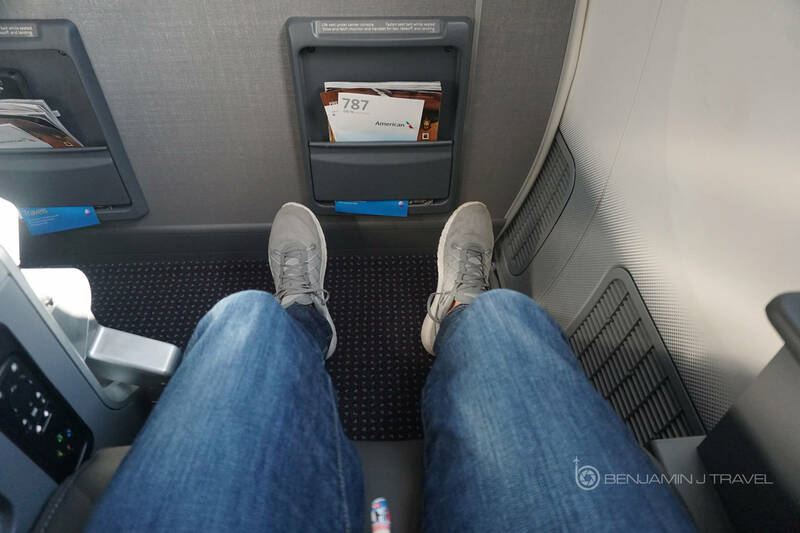 I am 5’10” and had plenty of leg room in the bulkhead. My nap was pretty short considering the length of the flight but in order to fight too much jet lag, I stayed up for most of the flight. Even thought we departed Madrid about an hour and 45 minutes late, we made up a lot of time in the air and it appeared we would actually arrive on time! 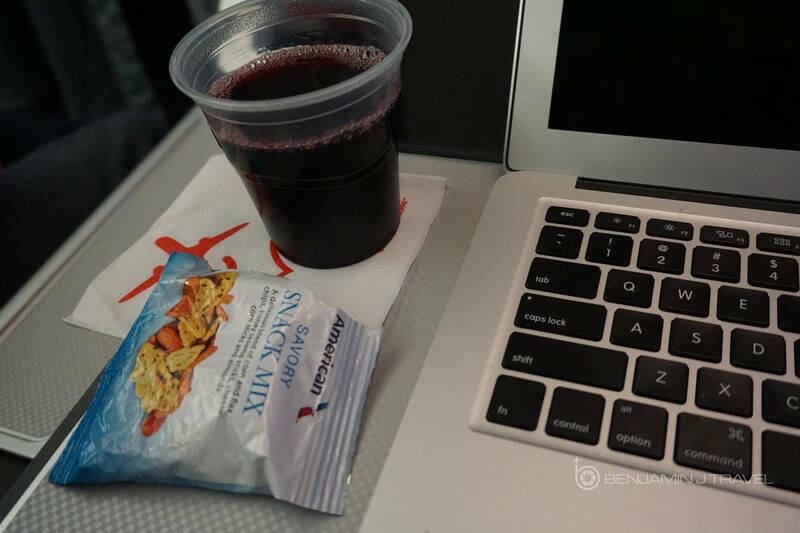 About 90 minutes before landing, somewhere over Illinois, the pre-landing meal service began. An Edamame Salad was offered which was one of the greenest meals I have ever seen. Literally, the color green on almost everything. Except the cheese and the side of shrimp. 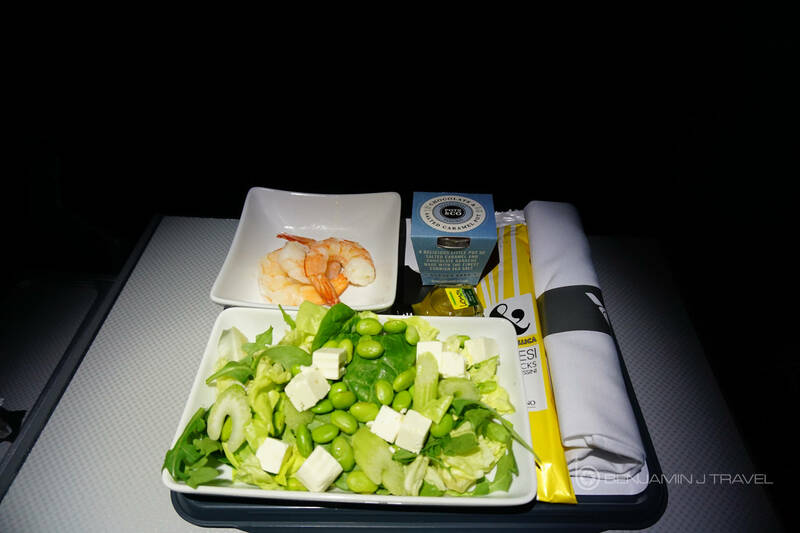 Joking aside, the salad was actually pretty good considering that most salads on a plane are really bland. About 20 minutes later, our trays were collected and the crew prepared for our landing at DFW. It was a bit rainy on the ground at DFW but we had a quick, smooth approach. There was quite a bit of traffic at Terminal D so we had to wait a few minutes for our gate. Deplaning was quite quick once at the gate but I stayed behind to snap a couple of quick photos of the cabin. The crew wished everyone goodbye and I thanked them for putting up with me on two flights in a row. The crew was a great mood in particular on this flight and I thought they did a better job on this flight than the outbound. 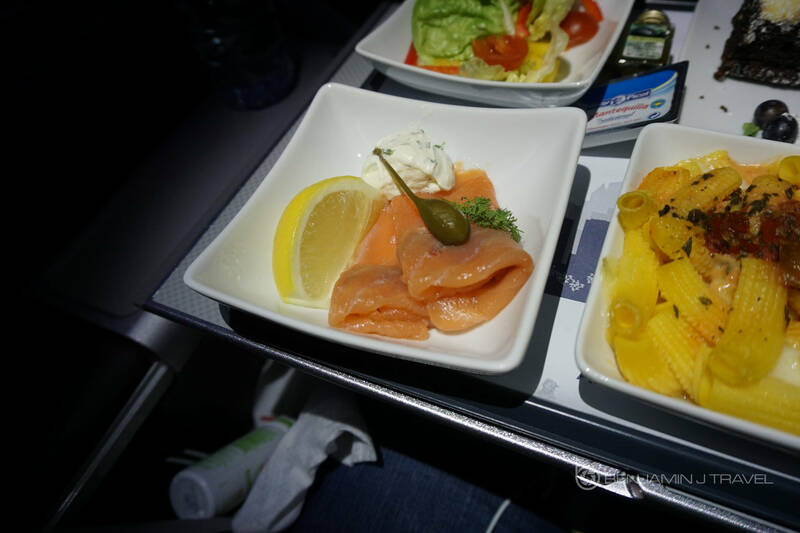 Add in the excellent catering on this flight, I can say I really enjoyed this flight. 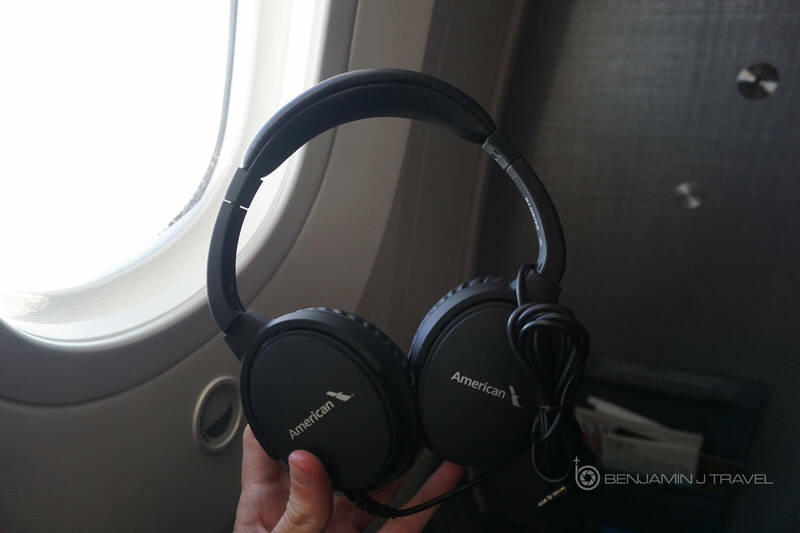 After a second AA Premium Economy flight with in a weekend, I deplaned still impressed with the new product. 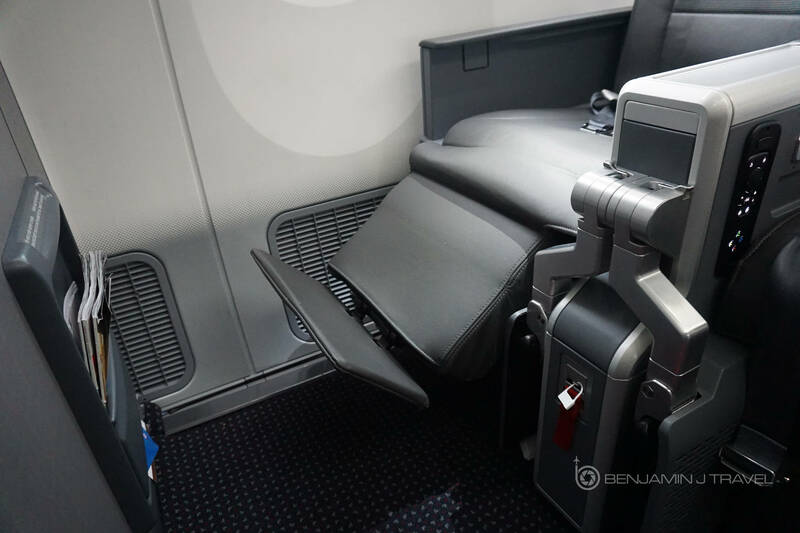 Maybe the seat isn’t “groundbreaking” but for a legacy American carrier, this is a huge step forward in the passenger experience. The seat has thoughtful features and comfort was kept in mind in the design. 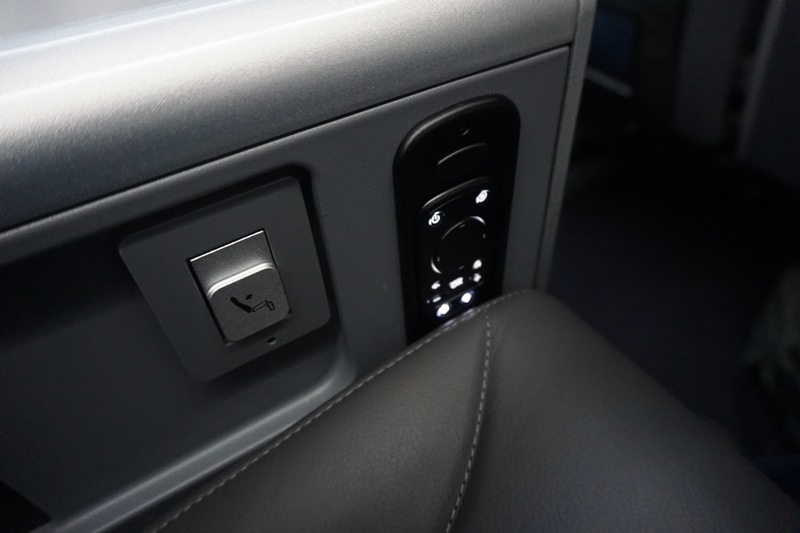 Plus the upgraded catering approaches Business Class quality. I plan to spend much more time in the Premium Economy cabin in the near future. Sounds like an amazing air line service. Looks like you had a great experience with them. Thank you for sharing the info. Very nice. Glad they’re using a different menu on the Westbound rotation. What was the pudding like on the second meal? 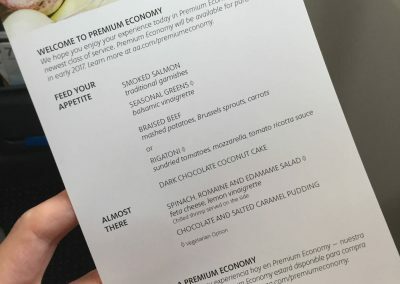 That looks like the same stuff that BA and Virgin serve in Y.
Yep, the desert was quite similar to that they serve in Y.
Yep, the desert was quite similar to that they serve in Y. Nothing fancy. GREAT report. I am doing a MR in January (DFW – CDG). Currently it is on the 789 outbound/inbound. Currently, my seats are outbound 9D and 9H. As background, I am ExPlat status. 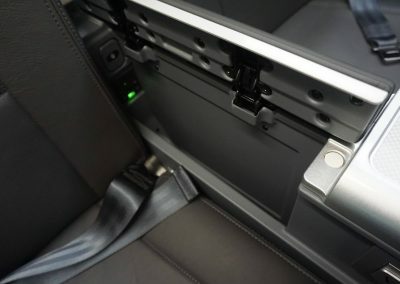 I have a few questions: (1) How noticeable was the space taken by the seat in front of you when it was reclined? 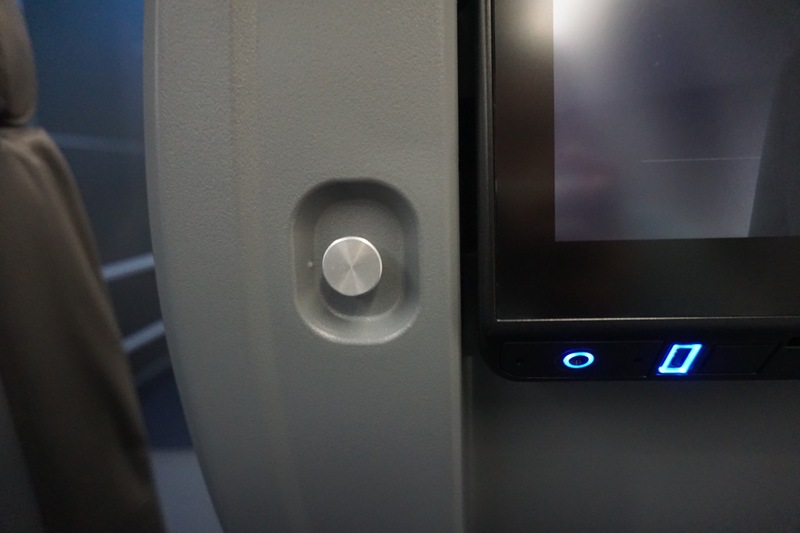 (2) For Row 9, did you notice any issues with the lack/fight for overhead locker space? (3) You mentioned some lav snafus on your outbound. How many lavs are dedicated to Prem Economy? 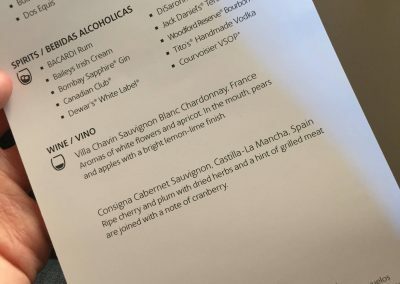 (4) I know that wine/beer are complimentary for international flights, how about a Gin/Tonic? Do you know if spirits are limited to one or need to purchase? (5) Was there a snack bar/counter set up? I am crossing my fingers that I don’t get a last minute equipment change. Thanks again for your report. 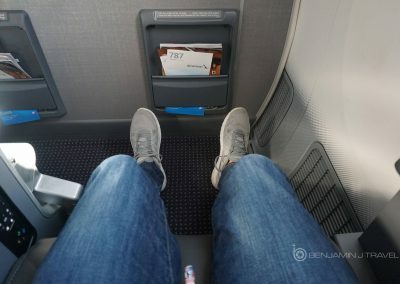 You’ll lose a tiny bit of space when reclined in the bulkhead row but I still had a bit of room on the floor, even with the leg rest extended. I had no trouble finding bin space in Row 9. There was no dedicated Prem Economy lavatory. Passengers used the Business Class lavatory or Economy lavatory (the latter is quite a walk). Spirits like gin are complimentary. 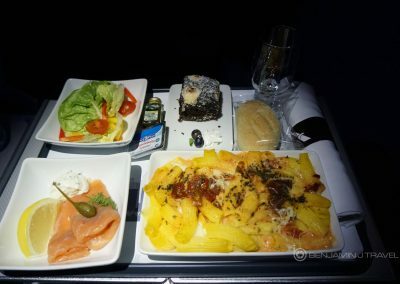 The snack counter was set up for Business Class passengers but the crew was unsure if Premium Economy passengers were “allowed” to access. 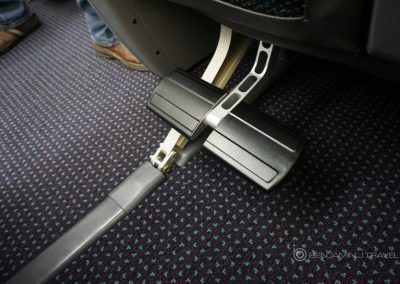 Hope you enjoy your flight and the 789 is your equipment. 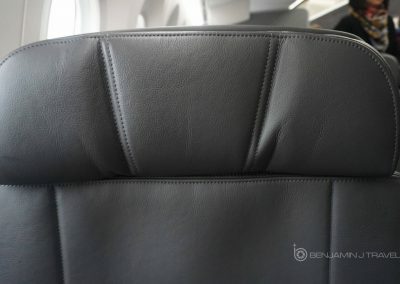 It’s a delightful aircraft! This is exactly the information I’ve been desperately searching the internet for. I will be in 9L for my 15 hour flight from LA to Sydney. So glad I got to see a picture of the space. Looks like I picked a winner! Thanks again for such a thorough review. Have a great trip, thanks for the feedback! 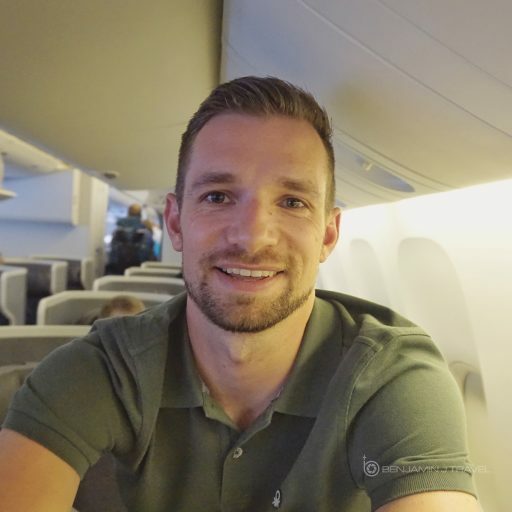 HI, I’m booking a flight out of DFW to Tokio, price for PE is quite reasonable (I think) as I’m booking several months in advance. 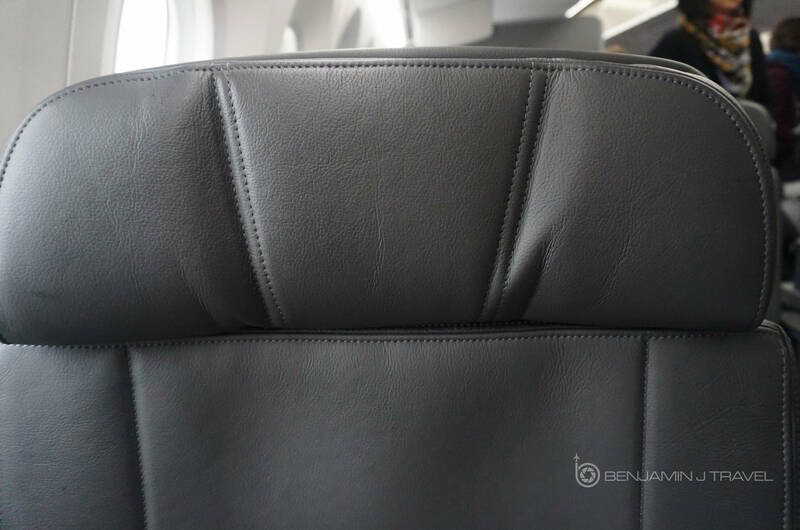 My question to you is, should I book bulkhead or another row? PE I definitely worth a moderate price premium on that long of a flight. It’s a personal choice but my favorite seat is the bulkhead window. I like having a window plus there’s enough room to go to the lavatory without disturbing your neighbor in the aisle seat.